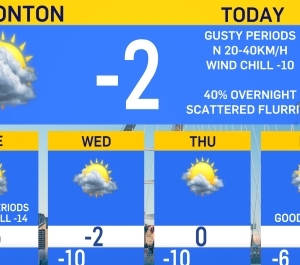 Election day in Alberta and we're off to a chilly start to Tuesday across the Edmonton Metro Region and most of province. Almost everyone is starting the day a couple degrees below zero. BUT...most areas should bounce back to double-digits this afternoon. 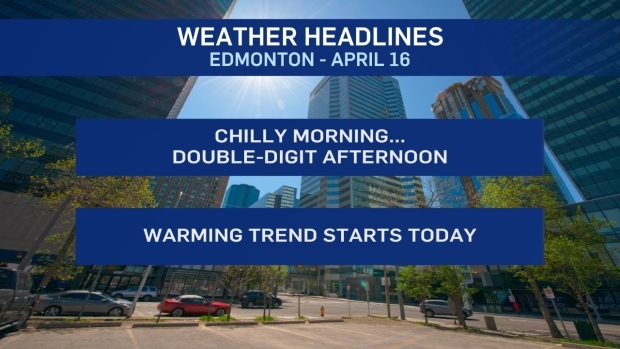 AND...it'll be a sunnier day for Central and Northern Alberta. Mainly Sunny to Partly Cloudy skies and just a few widely-scattered showers popping up late this afternoon. It gets a couple degrees warmer Wed/Thu/Fri with Afternoon Highs in the mid teens. A chance of showers or periods of rain Friday night and/or Saturday will cool things off for the start of Easter weekend. Warmer & sunnier Sunday/Monday for most areas. Thursday - Increasing afternoon cloud. Friday - Mostly cloudy. 40% chance of late-day showers. Saturday - Mostly cloudy. 60% chance of showers.